If your child is starting to learn human biology, give him a great study sheet with this anatomy worksheet about the pancreas. He'll get a grasp of some important terms and concepts, and learn the different parts of the pancreas. To learn more about the body, see our series of Human Anatomy sheets. Learn about our body's largest gland with this human anatomy info sheet. Get a head start on human anatomy with this info sheet on kidneys. Learn about how the human eye works with this anatomy sheet. Learn about the structure and function of the nose with this human anatomy sheet. Studying human anatomy? Here is a great sheet that shows a diagram of all the muscle system. Your child will learn the scientific terms of the major muscles. Give your child a great guide to the anatomy of our ears with this anatomy worksheet. Learning about the human body doesn't have to be a pain in the neck! 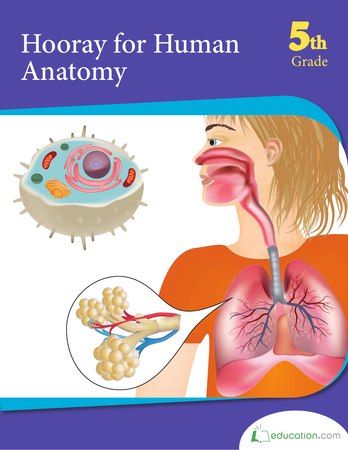 Our anatomy workbook features diagrams that are a sight for sore eyes and activities to give your kid a fun-filled shot in the arm. Introduce your child to the anatomy of our tongue with this diagram and info sheet. Learn all about the liver with this anatomy sheet. Our liver is one of many organs in the digestive system expelling waste from the body.